(GAMEWEEK 1) at Etihad Stadium, Manchester. MANCHESTER - Manuel Pelligrini's Manchester City made a huge statement to their title rivals after dismantling Newcastle in a dominant 4 - 0 win. Prior to kick-off, there was a tribute to the late Bert Trauttman, with everyone in the Etihad Stadium paying their respects to the Manchester City legend. Manchester City started off quickly, with pressure on Newcastle United and Pablo Zabaleta's shot being driven straight at Tim Krul. The Magpies' keeper would be brought into action just over a minute later with an attempt from Dzeko after promising link-up play between himself and Jesus Navas. Manchester City solidified their flying start within six minutes, with David Silva capitalizing on Krul's parry of a cross, heading it in to start their season off emphatically. The Citizens continued to press after the goal, not leaving Newcastle much space although Hatim Ben Arfa had a shot on goal, only to be offside from the mistimed run - but something to take forward for Newcastle in the game. Yaya Toure went down in the box in the 12th minute but the referee waved it off. In my opinion it should have been a penalty, Yaya Toure was take down and denied. A chance was denied to double City's lead. 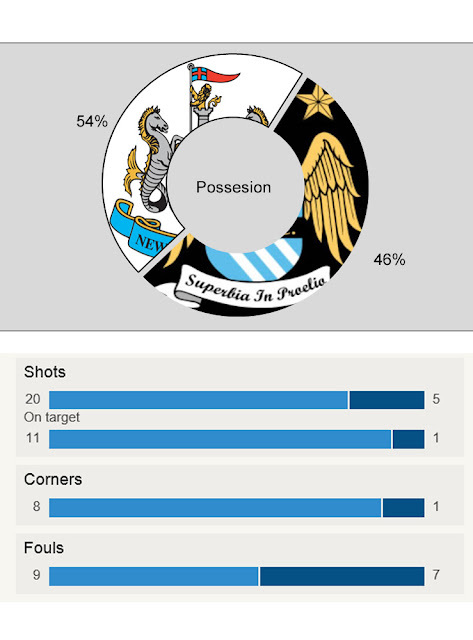 Newcastle United really did not get much done in the first twenty minutes or so. Manchester City continued to make it uncomfortable, with their best chance being the free-kick of which Ben Arfa made a mess of. Any attacking attempts just seemed to disperse and end up on the other end of the pitch, most notable in the 22nd minute when it in fact conceded a goal. The attack was broken up allowing City's defense to clear away safely, with Kompany surging forward, then a pass to Dzeko who helped Aguero on with a delightful backheel. Aguero found himself against Steven Taylor, in the direction swaying off goal, but Aguero took the shot and it clipped the inside post and went in. Superb finish to double City's lead. Manchester City's defense kept things really secure, with any crosses being sent back with a powerful header or clearance, allowing City to have another run at goal. The first booking came in two, with Mapou Yanga-Mbiwa pushed Edin Dzeko after the ball went out of play, and Edin Dzeko got in his face. But there was not really a fight, if you are looking for that, see what happened at SummerSlam last night. Moussa Sissoko was booked just over a minute after after a foul out of frustration. While Newcastle did have their fair share of possession in the first half, they were not doing near enough in comparison to Manchester City's effectiveness on the ball. There was just not enough good service up to the players up front, meaning Newcastle's chances came slim and slow. Tiote had a chance that did not pose a threat to keeper Joe Hart, but props to him for taking the shot and having a go. Just before the 3 minutes of stoppage time, Dzeko could have easily made it 3 - 0 to Manchester City, as a well-timed run from Aguero allowed him to put in a near-perfect cross, only for Edin Dzeko to head wide. Steven Taylor's penultimate action in the match was a potential handball penalty shout. 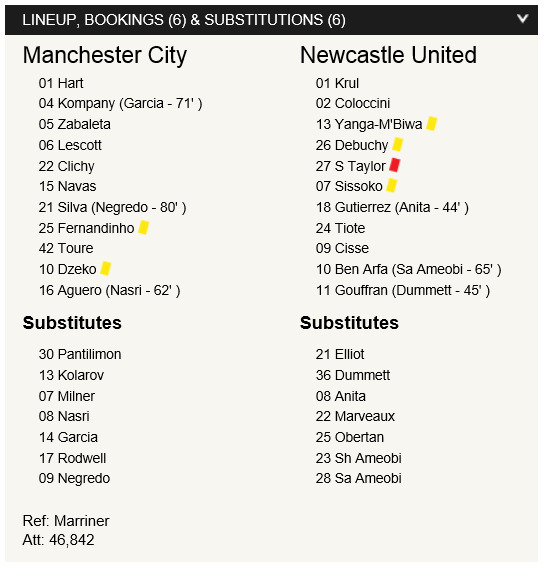 His final one would increase Newcastle's woes when he received a straight red card for a foul on Sergio Aguero, right before half time too - it looked like Newcastle were beaten. Manchester City had a dominant first half, pressing on Newcastle United and keeping a real tight defense that meant Newcastle had minimal legitimate chances. The problem for Newcastle is the balls going up to the forwards are not good enough, they were being picked off by City's defence time and time again, and the center halves would send it forward allowing City to take control. The red card to Steven Taylor just before half time may have crushed Newcastle. They were at City's mercy now. Newcastle were really up against it when the whistle blew to begin the second half. And just 5 minutes in, things would get even worse for The Magpies, as Yaya Toure scored a sensational free-kick that was awarded when Debuchy fouled Aguero. Excellent free-kick by Yaya Toure. City continued to press for chances, the game quietened down but Newcastle seemed on the backfoot for a majority of the game. Manchester City just dominated, and they did not even sit back that much, as they continued to chase down the ball when they lost possession. City's captain Vincent Kompany picked up a minor injury but was substitued for Javi Garcia on a matter of precaution, as the Belgian seemed to overstretch when he was defending. Substitute Samir Nasri made it 4 when he slotted it past Tim Krul, to further solidify City's win, and it made Newcastle's night even worse. More chances came, but City did not score on them. They simply cruised to a dominant win. Manchester City now lead the Premier League table with the 3 points and a goal difference of 4. Could this performance mark their intent to remain there at the end of the season? The game ends with City at the top, and Newcastle right at the bottom. Steven Taylor's sending off was devastating to Newcastle. Their key centre-half was sent off at a pivotal time before the half-time whistle and Newcastle went in with less hope. The defence were struggling to cope already, this made it worse. The speculation about Cabaye's possible move to Arsenal just felt like it left the team unsettled, damaging morale and being negative for The Magpies. There were not enough game-changers on the bench for Newcastle. Things are needed to be done as soon as possible in the transfer market. The main problem for Newcastle in the first half was the fact that the forwards' supply was simply not good enough, thus allowing Man City to take control. Manuel Pelligrin's 4-4-2 is a traditional, yet effective formation for City's win. It worked really well throughout the game. Outstanding defence from City keeps the clean sheet, Newcastle had minimal chances during the game with Kompany and co. keeping things secure. A fine performance by Edin Dzeko throughout the game. Unlucky that he did not convert on his chances, but he played great throughout the game. Yaya Toure - Man of the Match. Manchester City run riot with an excellent performance over Newcastle. Manuel Pelligrini wins on his Premier League debut, but it's disastrous for his Newcastle counterpart. An excellent Yaya Toure free-kick takes the highlight reels. The absence of Anton Cabaye proved costly for Newcastle, who were lackluster throughout especially with Steven Taylor's sending off. Manchester City with a dominant victory that sees Newcastle suffer their heaviest away defeat. Manchester City are going for the title, and what a way to start. Coverage, analysis and more as part of this match report for Manchester City vs. Newcastle United in the 2013/14 Barclays Premier League on Monday19 August, 2013.